The Rebalance author Mercy Kuo regularly engages subject-matter experts, policy practitioners, and strategic thinkers across the globe for their diverse insights into the U.S. rebalance to Asia. This conversation with Dr. Nicola Casarini – Senior Fellow for East Asia at the Istituto Affari Internazionali (IAI) and member of the Editorial Board of The International Spectator; author of Remaking Global Order: The Evolution of Europe-China Relations and its Implications for East Asia and the United States (Oxford University Press, 2009); and co-editor of European Foreign Policy in an Evolving International System: The Road towards Convergence (Basingstoke and New York, Palgrave MacMillan, 2007) – is the 64th in “The Rebalance Insight Series”. What is the impact of Brexit on EU-China relations? Brexit has triggered competition among EU member states to replace London as the “entry door” for Chinese investments in Europe. The Old Continent has clearly become the preferred destination for Chinese investors, with the U.K. receiving the biggest share. According to the China Global Investment Tracker, between 2005 and 2016, China invested nearly $164 billion in Europe (including non-EU countries). During the same period, it invested $103 billion in the United States. To facilitate Chinese investment and lower transaction costs, European governments and central banks are actively working to make the renminbi [Chinese currency] a viable reserve currency. Also in this case the U.K. is in the lead. After Brexit, we are witnessing a scramble from continental Europe’s financial centers – Frankfurt, Paris, Amsterdam, and Milan – to capture a portion of the renminbi trading and services currently operated by the City of London, a trend which further contributes to the re-nationalization of EU-China relations. In his recent “State of the European Union” address, European Union Commission President Jean-Claude Juncker called for tougher “trade defense instruments” vis-à-vis China’s steel exports. What are potential consequences of this stance? Following the “State of the European Union” address, the EU imposed more import duties on Chinese steel, which rose as high as 73.3 percent for heavy-plate steel and 22.6 percent for hot-rolled steel. China’s commerce ministry immediately condemned the latest duties, calling them “reckless trade protectionism” and implicitly accusing the Europeans to use China as a scapegoat for not reforming their domestic industries and markets. Tougher trade defense instruments serves to assuage the concerns of those EU member states – such as Italy, France, and Spain – that feel the pressure of Chinese competition more acutely. There is, however, risk of retaliation from the Chinese side, which could target sectors such as luxury goods, fashion, and food in order to harm the more protectionist EU members. This could offset some of the gains of the steel industry, raising the question as to what sectors should be defended/promoted in the Chinese market. With the Trans-Atlantic Trade and Investment Partnership (TTIP) between the United States and EU faltering, the EU and Canada are looking to seal a deal on the Comprehensive Economic and Trade Agreement (CETA). What are differences and similarities between U.S. and Canadian leadership in driving regional trade agreements? The U.S.-led TPP aims to create a trading bloc in the Asia-Pacific which excludes China. Canada, instead, seems to be open to consider a FTA [free trade agreement] with Beijing, according to what Justin Trudeau said when he first visited China in September. Differences between the United States and Canada in driving regional trade agreements have been evident in the negotiations with the Europeans. For the EU, it has been easier to negotiate the CETA, also because the latter does not have the same geopolitical ambitions of the TTIP and Canada has accepted to include the cultural exception favored by the Europeans. In CETA, the whole cultural and media sectors are in fact on the negative list so that they are not subject to the agreement. In TTIP, the request by the EU to exempt the culture and media sector has been, so far, rejected. The Canadian leadership’s readiness to compromise on regional trade agreements stands thus in stark contrast with the more rigid attitude of the United States. European Council President Donald Tusk emphasized “rules-based international order” in his July speech at the EU-China Summit. How will the EU counterbalance China’s growing global influence in preserving rule of law in international affairs? The EU is possibly the staunchest supporter of the rule of law in international affairs, something that puts it at odds with China – but also with the United States at times. This was clearly on display last July, when the High Representative issued a declaration on behalf of the EU following the Award rendered in the Arbitration between the Philippines and China, stating the need for the parties to the dispute to resolve it in respect – and in accordance – with international law, including United Nations Convention on the Law of the Sea [UNCLOS]. While China was the main target of the declaration – even though there was no direct mention of it – we should not forget that the United States has never ratified UNCLOS. The response of Washington to the Arbitration ruling was to send the U.S. Navy in the area to demonstrate U.S. commitment to defend the current status quo in the South China Sea, by force if necessary. For Europe, which is essentially a soft power in Asia, the best way to uphold the rules-based international order in the region would be to adopt a two-fold approach: on the one hand, Brussels should continue engaging with Beijing, through dialogue and political cooperation. On the other hand, individual EU members should be allowed to participate in U.S.-led initiatives, such as freedom of navigation operations, to reinforce the message – without, however, giving the impression that the Union as a whole is taking side. Only by remaining neutral will the EU be in a better position to promote the rule of law in international affairs. Identify the top three trade and security priorities in U.S.-EU-China relations facing the next U.S. administration. A priority for the next U.S. administration will be to find a compromise with the EU and China to avoid the emergence of competing trade blocs. This will be particularly pressing if the U.S. Congress fails to pass the TPP, and the United States and EU do not succeed in finding a compromise on the TTIP. Then, the China-led RCEP [Regional Comprehensive Economic Partnership] will get a boost, but also plans for an EU-East Asia trade agreement will be resurrected, increasing the prospect of a Eurasian trade deal which will exclude the United States. Another priority for the next U.S. administration will be to avoid a transatlantic rift over market economy status (MES) to China. Washington has already declared that it will not grant Beijing the coveted MES. The EU, instead, is working on a compromise, which will entail recognition of market economy to Beijing, while reinforcing the existing trade defense measures to protect some European sectors considered of strategic significance. The compromise has three aims: avoid retaliation from Beijing; increase market access for European companies in the Chinese market; and send the message that Europe is more open than the United States– something that will undoubtedly attract more Chinese investments into the Old Continent. The third priority for the next U.S. administration will be to discuss security in Eurasia with China and Europe. The United States is disentangling itself from Central Asia and the Middle East, while China makes inroads into these regions through its Belt and Road initiative. 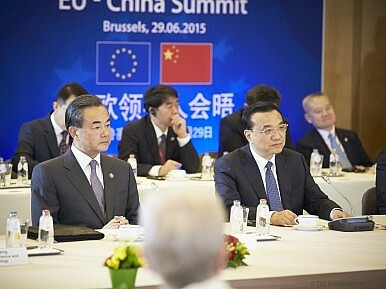 Europe has strong security ties with Washington, but Brussels is also tempted to push forward security cooperation with Beijing, particularly in the Mediterranean and along the Arabian coasts, given the economic significance of Southern European ports and the Suez Canal for China’s maritime Silk Road and future Sino-European trade relations.